This is a joint project in Church Street, in partnership with the Mosaic Community Trust, to train local residents – particularly those with English as a second language – to become mental health facilitators and massage therapists through a qualified training programme. In turn they are able to act as champions for their respective communities. As part of the programme a ‘Community Celebration Day’ was held in December at Church Street Library – many people, including GPs and practice managers from the local health centres, attended to discuss patient participation and how local people can play an active role in terms of their care needs. The project has 15 students and they will be graduating as massage therapists this month! The training will equip the participants with relevant skills to work as therapists or freelance in a salon. Some students demonstrated their newly acquired skills at the event in December and at Church Street’s New Year’s New You event in January. Myrna Shoa and Timuchin Dindjer have run six workshops with our English Speaking Clubs members at Church Street Library, using multimedia arts and story-telling prop materials. Participants have created a visual record of their stories through collages, drawings, words and photos. All these culminated into an exhibition at WAES which was opened by the Lord Mayor of Westminster, Cllr Steve Summers. A great partnership has been forged with Queen’s Park Community Council and Paddington Development Trust’s (PDT) employment programme to introduce a new service at Queen’s Park Library. The PDT Employment Adviser, Shah Alam, is based in Queen’s Park Library every Tuesday (10.30am-3.30pm). Shah works with Westminster residents, long term unemployed and job seekers, men and women over the age of 19, on a one to one basis. He sees them for a series of Information, Advice and Guidance sessions, a minimum of six and at a pace set by the client. Sessions can cover motivation and confidence, skills and referrals to training, CV creation, job search and applications, interview techniques and practical support. S hah is enjoying meeting with different community members, people with different needs and expectations from a job and who are balancing different responsibilities of family and childcare and other commitments. Contact Queen’s Park Library to find out more. 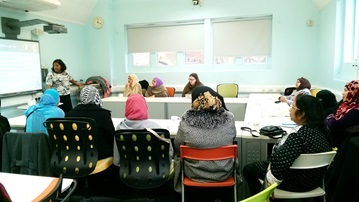 A series of parenting seminars were organised and delivered at Queen’s Park Library, in partnership with Westminster Early Help Team & Parenting and Fast Co-ordinator, Madhu Chauhan. Fifteen local people have attended the seminars over three weeks learning about raising resilient happy children, instilling positive behaviours at home so they become happy, well-rounded and able to achieve their full potential. Feedback ranged from great to excellent after all these workshops! 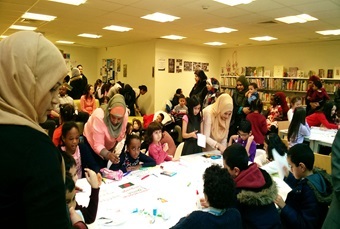 Another successful event was held at Pimlico Library in partnership with Westminster Bangladeshi Association (WBA) on 16 February to commemorate International Mother Language Day – a day to promote awareness of linguistic and cultural diversity and multilingualism. The event attracted over a hundred people into the library. 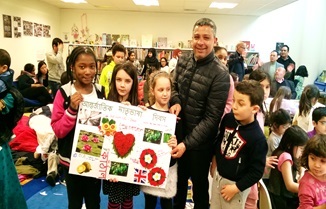 We saw children making collages with signs and symbols of their native countries, with images of healthy food and key healthy lifestyle messages in different languages. Children also took part in a colouring completion and poetry performance as well as speeches about the importance of cultural diversity in language and why it is important to learn English in this multicultural city of Westminster. 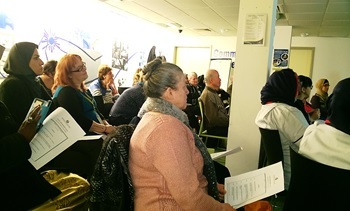 This event was also supported by various organisations such as My Time Active, Westminster Memory Service, Health Information Co-ordinator and Health Trainers. Magdalena works at Queen’s Park Library helping out with Basic Computer Sessions and the English Speaking Club. She also helps colleagues with shelving. 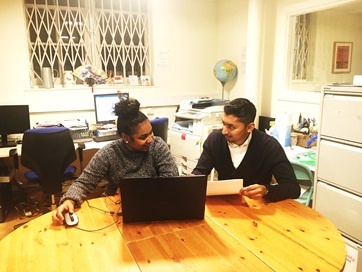 Recently, she has acquired a job as she has been growing in confidence through her volunteering with the Bengali Service in Westminster Libraries. Congratulations Magdalena! 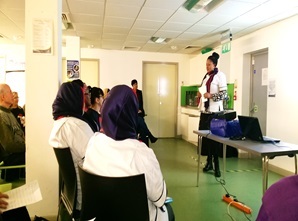 The Bengali Service also marked International Women’s Day with an event at Church Street Library, with some high achieving local female guest speakers to inspire the local women of Westminster as well as service providers ranging from the education, training, employment, health and wellbeing sectors. Watch this space for more news! 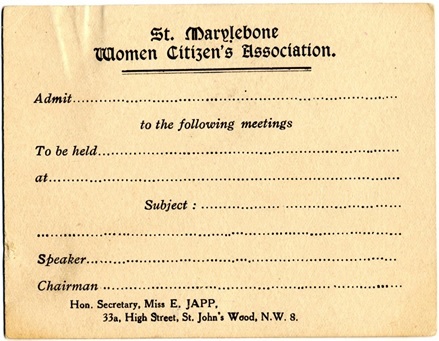 The St Marylebone Women Citizen’s Association arose out of a meeting convened by the local branch of the London Society for Women’s Suffrage. It was decided to form an association to promote ‘citizenship’ among the women of St Marylebone. “[o]rdinary members of the Committee shall serve for three years – four shall retire each year in rotation and shall not be eligible to serve again until the following year”. Meetings were to be called upon written requisition of 30 members of the Association, or by 2 members of the Executive Committee. Promoting citizenship meant advancing women’s understanding of social, political, and legal issues, thus encouraging their greater involvement in decision-making and the electoral process. During the first year, members of the association gave lectures to the Girls’ Friendly Society, the North and South Marylebone Schools for Mothers and Church Army Girls’ Club. External speakers were invited to speak on such subjects as housing, women’s working hours and the Ministry of Health Bill. 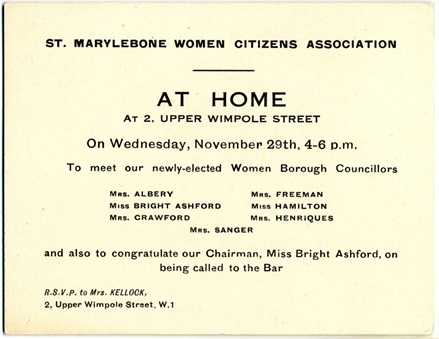 The Association was always keenly interested in local government and women candidates for both St Marylebone Borough Council and the London County Council often came to address meetings. Speakers covered subjects like ‘Finance of Government’ (23 February 1921), ‘Criminal Law Amendment Bill’ (16 March 1920), ‘Abolition of the Death Penalty’ (16 November 1925), and ‘Suffrage of Women in India’ (18 December 1931) – topics which, at least at the Association’s early beginnings, would have been unusual conversation topics for even the most learned women whose interests had been frequently confined by social norm to the arts and philanthropy. The Association also organised visits to the Palace of Westminster (13 January 1923) and to the new Public Library (2 November 1923) before it opened a month later on 18 December. The first meeting took place on 1 July 1918 and the first Chairman was Mrs Lauritson Shaw. She was succeeded in May 1919 by Miss E Bright Ashford who remained as Chairman until 1938 and who also served for many years as a Councillor on St Marylebone Borough Council. 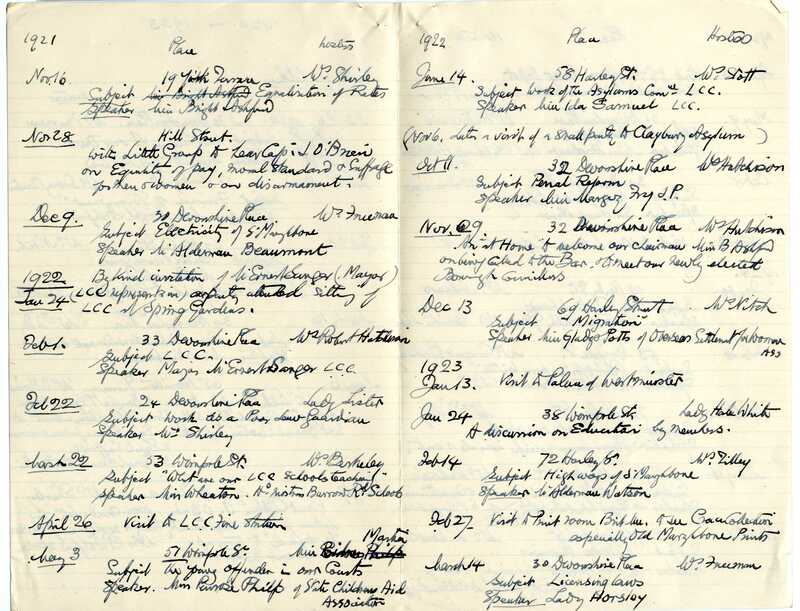 By May 1919 the Association had attracted 40 individual members and around 192 members in affiliated societies (Catholic Women’s Suffrage Society, Women’s Liberal Association, Women’s Local Government Association and the Women’s Section of the Labour Party). In 1928 the Association had 89 members, a number which had declined to 66 by 1933. 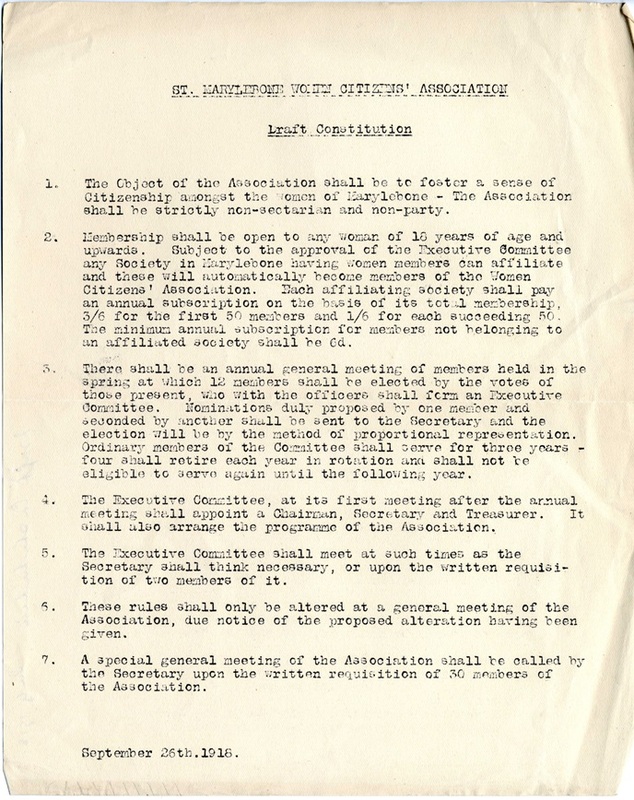 In that year a circular was sent to members seeking their opinion as to whether the Association should continue to function. This seems to have been provoked by falling membership and poor attendence at meetings. Only 15 members expressed a positive opinion that the Association should continue and there seems to have been little activity between November 1933 and April 1938 when the Association was finally wound up. It is clear that throughout its existence the Association played an important role in helping to educate the women of St Marylebone and encouraging them to take an active role in local government.